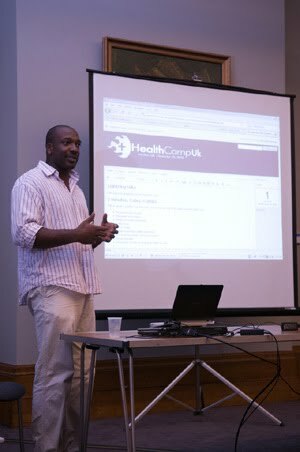 HealthCamp UK is a health care unconference: an event for people who want to improve health care: clinicians, entrepreneurs, investors, managers, engineers... all are welcome as long as you are ready to collaborate. Session 1: How to help people in the developing world / how to benefit from innovations from the developing world? How we accelerate adoption of telemedicine? How to coordinate an international software commons? Session 2: How to maximize wellbeing by integrating voluntary work into fitness activity? How do we learn from failures in an open source way? How to protect patient records and maintain governance? Session 3: Room 1, How do we get ordinary doctors to publish their cases? How to use software to co-ordinate measurement of many health and fitness activities? We are delighted to be holding HealthCamp UK 2009 at the Department of Health's NHS Innovation Expo, "a unique opportunity to catch up with the best in healthcare innovation from the public, private, voluntary, academic and scientific communities". For more information, please see here. No one unconference is like another; that's the beauty of it. Breakfast out of the way, we'll start with an introductory session with 2 minute lightning talks from delegates, and the chance to learn a bit about each other. The discussion topics are then voted on and the day gets under way (9 discussions run in 3 parallel rooms). We tie things up with a final session where a representative from each discussion shares the key learning points. Entrance is FREE, but by invitation only as we are limited to 60 places. You can apply for your place here NOW.